Unfortunately, I am no stranger to a wicked stomach ache but sometimes there are stomach aches that just make you want to curl into a ball and hide away from the world. When I feel this way the only thing I can imagine eating is a hard pretzel and some ginger ale. About two weeks ago I was blessed with one of these stomach aches so I decided it would be a good idea to make myself some gluten free pretzels. I embarked on my journey with an uneasy stomach and an unfounded sense of confidence that I could be clever enough to tackle the creation of gluten free hard pretzels. Following multiple pretzel recipes loosely I concocted a pretzel dough. I let it rise for an hour or so and then began forming my “pretzels”. I am not sure if it was my lack of pretzel forming skills or the dough’s unwillingness to work with me but the traditional pretzel shape seemed to be out of the question. I tried negotiating with the dough but alas I was ignored and the pretzel logs were created. I covered them with pretzel salt and got them baking in the oven. 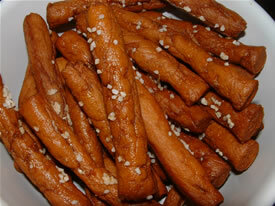 After about an hour I found myself eagerly anticipating the emergence of crispy, salty pretzel logs from the oven. But after about an hour they were not done. So on they baked for another 45 minutes. When they were finally done I spread them on a cooling rack and waited patiently while they sealed in their crispness. After about another 30 minutes I poured myself a glass of ginger ale and grabbed a handful of my little beauties. I popped one in my mouth…and…and…I damn near broke one of my teeth! They were hard as rocks. I thought that maybe I grabbed a bad one so I tried another…sadly I found the same result. I will say that they did look pretty good and they were tasty…but the last thing I need to do is increase my dental bills. For the sake of innocent teeth I am not going to share this recipe but I will be working furiously to come up with a perfect recipe that I can share. No person should have to be without pretzels and ginger ale when their stomach is aching. Pretzels 1…Gluten Free Cook 0…I will prevail!